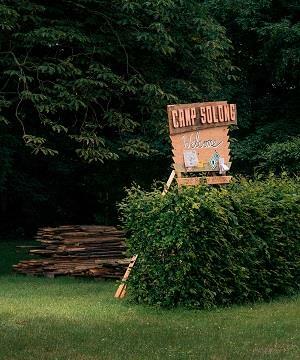 We, artists Dafna Maimon and Ethan Hayes-Chute, will be hosting a 3-day summer camp: “Camp Solong” at Kunstverein Braunschweig weekend of August 19-21st within the exhibition Process, Performance, Presence. Currently we are looking for campers to join the summer camp! This could be anyone (adult) who would like to have a “performative” experience/adventure, or just a 3-day break from daily life. Further instructions on how to apply can be found at campsolong.org. The central theme for the summer camp program is the universal task of saying “goodbye”. Anyone interested in rehearsing and exploring further the process of “separation” and “farewells” would be an ideal participant for the camp. During the summer, the camp is being built in the Kunstverein’s garden, and can host 6 people along with the camp directors Hayes-Chute and Maimon. All campers will have their own bunk-bed in the camp structure and a personal shelf. Food and entertainment will be provided. There will be a 3-day programme which is built from the artists’ respective performative practices. The idea behind the summer-camp format is to break down the borders between experience/process and end result. We are setting up a camp not to create a singular performance but to host and cater a collaborative experience and experiment. If you, or anyone you know, is up for joining our summer camp, don’t hesitate to forward this email! Of course, feel free to get in touch directly! Looking forward to your applications!! The summer camp will be held only in English. For further information please have a look at the Camp-Webside http://www.campsolong.org. Application via: campsolong@gmail.com. We are looking forward to your interest and to receiving your application by August 4th! Wir, das sind die Künstler Dafna Maimon und Ethan Hayes-Chute, veranstalten ein drei-tägiges Sommercamp: „Camp Solong“ im Kunstverein Braunschweig am Wochenende des 19. bis 21. August im Rahmen der Ausstellung Process, Performance, Presence. Weitere Informationen finden Sie auf der Homepage zum Camphttp://www.campsolong.de. Anmeldung über: campsolong@gmail.com.